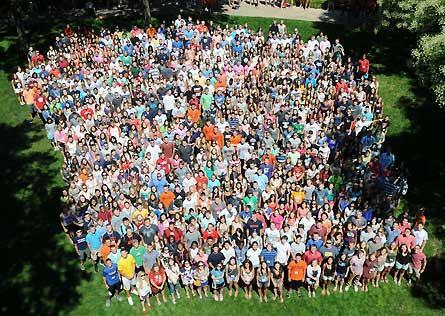 Hope College has again enrolled a record number of students, topping 3,300 for the second year in a row. Hope has enrolled 3,388 students this year, a total that includes three of the largest incoming classes in the college’s history. It is the third year in a row that Hope has set an enrollment record, and the eighth consecutive year that enrollment has been above 3,200. Last year’s enrollment was 3,343, a total buoyed by a record-number 904 first-time students. Seeking to moderate the overall increase, Hope enrolled 822 first-time students this year. The enrollment by class, with last year’s class in parentheses, is: freshmen, 827 (889); sophomores, 860 (818); juniors, 758 (728); seniors, 851 (816); and special students, 92 (92). The student body consists of 1,344 men and 2,044 women from 39 states and territories and 34 foreign countries. The largest representation is from Michigan with 2,263 students. Other states represented with 10 or more students include: Illinois, 507; Indiana, 104; Ohio, 77; Wisconsin, 52; California, 45; Minnesota, 35; Colorado, 19; Florida, 19; Texas, 18; Iowa, 15; Virginia, 14; Pennsylvania, 13; New Jersey, 11; New York, 10; and Washington, 10. Foreign countries represented in the student body include: Barbados, Brazil, Bulgaria, Burundi, Canada, China, Cuba, the Dominican Republic, El Salvador, France, Germany, Ghana, Honduras, India, Ireland, Japan, Jordan, Kenya, Liberia, Mexico, Nepal, the Netherlands, Nigeria, Peru, the Philippines, Rwanda, South Africa, South Korea, Taiwan, Thailand, Turkey, Uganda, the United Kingdom and Vietnam. Students transferring to Hope from other colleges and universities total 50, compared with 47 in 2012. There are 68 students in off-campus programs, compared to 85 last year. Hope College was chartered in 1866 and is affiliated with the Reformed Church in America (RCA). The college offers courses in 91 majors leading to a Bachelor of Arts, Bachelor of Music, Bachelor of Science or Bachelor of Science in Nursing degree. Guest artist Yun Kyong Kim will present an organ concert at Hope College on Tuesday, Sept. 17, at 7:30 p.m. in Dimnent Memorial Chapel. Families and students engaged in the college search will have the opportunity to connect with more than 70 colleges and universities during the Holland Area College Night, which will be hosted by Hope College on Thursday, Sept. 26.